Auerbach, Robert D. Deception and Abuse at the Fed; Henry B. Gonzalez Battles Alan Greenspans Bank. Austin, TX: University of Texas Press, 2008. Gonzalez, Henry B. The Relinquishment of Co-Equality by Congress." Harvard Journal on Legislation29 (Summer 1992): 331-56. 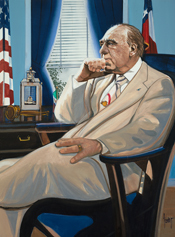 Henry B. González in Hispanic Americans in Congress, 1822-2012. Prepared under the direction of the Committee on House Administration by the Office of the Historian and the Office of the Clerk, U.S. House of Representatives. Washington, D. C.: Government Printing Office, 2012. Pycior, Julie Leininger. Henry B. Gonzalez," in Kenneth E. Hendrickson, Michael L. Collins, and Patrick Cox, eds. Profiles in Power: Twentieth-Century Texans in Washington. Austin, TX. : University of Texas Press, 1993. Wheelock, Warren and J. O. Rocky" Maynes, Jr. Henry B. González, Greater Justice for All; Trini Lopez, the Latin Sound; Edward Roybal, Awaken the Sleeping Giant. Consultants, Jorge Valdivieso, Amalia Pérez, Fabiola Franco. St. Paul, MN: EMC Corp., 1976.